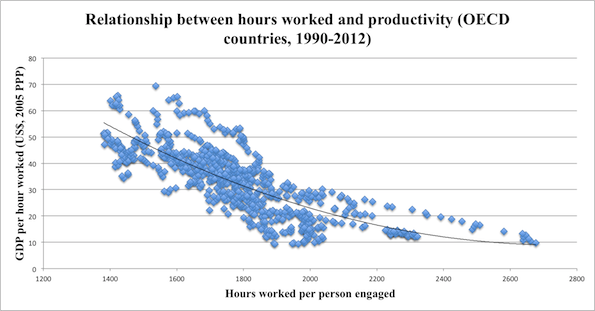 Scooper - Technology News: Does working fewer hours make you more productive? 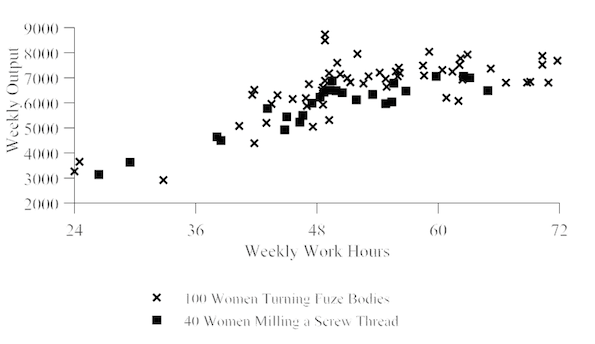 Does working fewer hours make you more productive? Want to work better? Work less, say researchers at the OECD, who have discovered an interesting correlation between how much you work and how productive you are: working longer hours results in a reduction of labour output. This chart shows hours worked per person in OECD countries between 1990 and 2012, and the GDP created per hour worked. It reveals that productivity is highest when people spend fewer hours working. The relationship between hours worked and productivity has interested economists for many years. But a new paper by John Pencavel of Stanford University, based on a set of data compiled during the First World War, may have the answers they have been searching for. The British Health of Munition Workers Committee (HMWC) undertook research into how to maximize the productivity of workers in munitions plants, looking at the link between work hours and work performance. Pencavel’s analysis shows that working more hours doesn’t necessarily increase overall output, but neither does working a very short week. He found that the optimum number of hours for productivity in munitions plants was around 48 per week. Below that amount, and output was proportional to the hours worked. But once workers clocked up more than 48 hours, output started to fall. The chart above illustrates this. Although these results appear to indicate that working up to 50 hours a week might increase productivity, they do not take into account service-sector professions: the type of work done by most people in advanced economies today. For these professions, where work is primarily self-directed and requires intellectual engagement, the optimum number of weekly hours may, in fact, be lower. Pencavel notes that the “profit-maximizing employer will not be indifferent to the length of … working hours over a day or week”. His new research could encourage companies to stop focusing so much on how many hours their employees are working, and instead look at ways of optimizing productivity – even if that means they end up working less. Have you read? Which countries work the longest hours? These countries work least - yet still prosper What is holding back productivity growth?